I have a new bear on eBay, Belladonna is dressed and ready for Halloween. 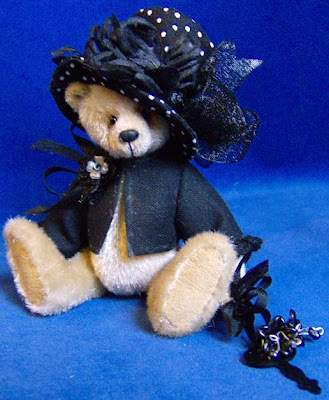 It is funny how sometimes you make a bear that is just that little bit harder to sell, I love Belladonna's hat it worked out just as I had hoped. Autumn has finally set in and we have had some really cold and rainy weather. The rain here is very gentle, you hardly notice it until you get stuck outside. So far we haven't had the violent downpours that I am used to from Cape Town but maybe that is still to come. All the trees are losing their leaves but at the moment looking out the studio window the trees are shades from green to brown to russet, it looks so beautiful. 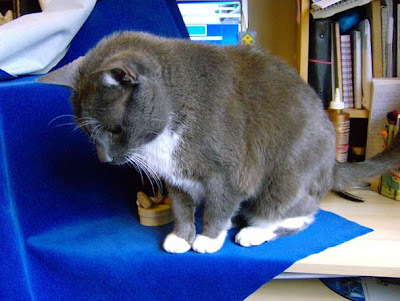 This is Sasha the photographers assistant, he just had to come and help when I was taking photos. Thanks for entering my Give Away! !